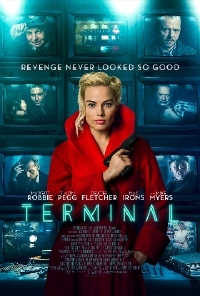 Particularly in it's first half, before the story really comes together, writer/director Vaughn Stein's Terminal (review), relies heavily on the performances and charisma of the actors. At the centre of the story is Margot Robbie who is clearly in her element as the eccentric and perhaps off-kilter Annie, Simon Pegg as Bill, the former teacher dealing with the knowledge that he's sick and will soon be much sicker. And then there is the duo of Alfred and Vince, Max Irons and Dexter Fletcher respectively, as a pair of assassins auditioning for a contract. Fletcher has a long and varied career dating back to the mid 70's in television, film and theatre not to mention a few films as director including the charming dramedy Sunshine on Leith and the hilarious biopic of English ski jumper Eddie Edwards Eddie the Eagle. Most recently, Fletcher stepped in to complete the upcoming Freddie Mercury/Queen biopic Bohemian Rhapsody (which looks stellar). We had a chance to ask Fletcher a few questions about his career both in front and behind the camera, and what appealed to him about his role in Terminal. You've talked in the past about being a working actor and taking jobs that don't always turn out so well but I assume that at this point in your career, you have more of a selection. What was it about this particular role that appealed to you? Certainly the production company and the people involved were very interesting. It helped, we got to chat Lucky Chap and Margot, you know, it was their first film producing and it's always exciting to be involved in the early days of an exciting new production company like that. And then, you know, the script just appealed to me and the character, that relationship with Max Iron's character. To play the older, wiser, and somewhat sort of cynical grizzled balded man just seemed like too good opportunity to miss. Lots of interesting elements. So I could go on forever, but the list is as long as my arm as to why and there was no ... column for not to get involved. I did exactly that. I had a schedule and it worked with my schedule, and I absolutely ... who doesn't want to play a hitman? Big sideburns who gets to smoke a big cigar and be a large piece of work. It was a great opportunity. The movie has a very specific look. Was it apparent from the early stages, perhaps even from the script, that this would have a unique visual style? It wasn't necessarily apparent from the script, but the dialogue and the twists and turns and thriller kind of aspects of it were. But it certainly very soon became apparent when I talked to Paul, the director, for about an hour and a half on the phone. I was away in Austria at the time I believe, and we had a phone call and he just didn't shut up for an hour. What are you gonna do? I think one of the first scenes that I shot was in an old disused power station in Budapest and they had a glass floor and made it all up red. And I completely understood that he was someone with a very unique visual sense and style. I got very excited about that. Your banter with Max feels so natural. Was it all scripted or was it improvised? Did you do anything special to build that ease with each other? Max and I had met before I think, but no we stuck to the script. The dialogue, the scripted dialogue, it seemed churlish to try and improvise around and over something that was so meticulously written. We had everything we could want as actors on the page already. So we just reveled in it, really enjoyed ourselves and kind of worked with the words that were on the page. And from my own experience from writing and directing as well I know that a lot of time and effort and consideration goes into dialogue and how certain characters communicate. And certainly with a piece as stylized as this, we felt it was important to stick to the dialogue. There might be one or two lines here or there that were thrown in for good measure, but on the whole, and I'd say 99% of everything that we say or do, it was scripted. But that's a real treat to have such strong material to work with. You've been working back and forth in TV and film since before shifting between the two mediums was in trend. Was it easier to move between the two mediums in the UK? No. As an actor, my career is never on the set path. And there's multiple assumptions that once you're known, you can pick or choose what you want to do. True to a certain degree. But also, you know, the job is a certain medium and you have to ... My philosophy is, can I take what characters or work I'm being offered or looking at and do a good job at them. And whether it's theater or film, radio or whatever medium it is, that's always the endeavor, so ...You know, you've gotta be adaptable as an actor I think and not ... as far as it goes, not necessarily precious about "I only do movies and that's who I am." I mean, that works for some people but I'm someone who just loves the craft of acting across all forms. And want to take them, every chance that is presented to me and simply perform. I imagine, can I do something and be good in this and the hope is that I can always learn something and do my best. Yeah, I'm happy to fail because it means I learned something. You've also worked as a director. Do you have a preference for acting or directing and what kind of projects do you look for when you decide to step behind the camera? Well that's like four questions ... I don't ... I love directing now because it still a new strand to sort of what will hopefully be a career. I started acting when I was six and I've been involved in film for ages really. And I think as a director, you look for films that kind of you feel ... for me personally, is there a story within this that I can tell? Is there something for me to say about my own experience? Something I understand about life in there? Whether it's something quite frivolous and fun or something quite serious and biting. And as an actor, you know, you don't always have to necessarily make those conceptions. But as a director, it's kind of like, there's many many stories, but if you get in the heart of it can I find something to say about what I understand. And be passionate enough that it's gonna get everyone on board and be able to drive that for two years. And then get all those different departments to come together and create something. So I mean, directing is a massive undertaking in comparison. I just think, the simple way to put it is like, "Have I got something to say within this story?" It could be an Avengers movie, there could be at the heart of it something about the human condition that we understand and that's what's important. But that's just me personally, I'm sure it's different for every director.